When I went to some of the affected areas this week to assess damages and get a picture of what happened, I was very moved by the courage of many, and also shocked by some of the damage I saw. Out of courtesy, I won’t provide pictures of the damages in this forum, unless it is for educational purposes. 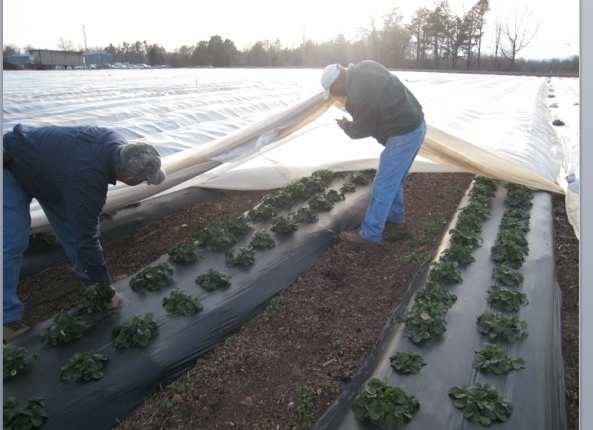 However, as you all know, the biggest problem in terms of strawberry is to get the field dry enough to lay plastic, fumigate, and to get planting material in time. Overall, the storm has delayed planting dates in many areas for several weeks. In the last two weeks, many of you have approached me and have asked for guidance on how to increase the growth of strawberry plants over a shorter period of time. There is no handbook or silver bullet solution to this situation! The bad news is that there is a good chance that yields will be affected by the storm next year. And for some, it might be too late, no matter what. If fields are still under water or too wet, equipment damaged, etc. My team at NC State University also has decided not to conduct some of my research this year, since it would delay planting even further and wouldn’t make a lot of sense. Especially with varieties such as ‘Camarosa,’ planting dates are more important and play a major role in fruit development and yield capacity. However, the good news is that there a few things you can do and a few things you should not do to help your plants to get established, even with a late planting date. The enhancement of Growing Degree Days (GDD) in fall might be one of the most important things to consider and I will elaborate on this quite a bit in the following. It is very unlikely that an over-supply of nitrogen will help your plants to grow faster. Please be careful with the amount of additional Nitrogen you intend to apply through the drip tape. An excess of nitrogen can harm the plant’s root system rather help developing it. However, making sure that your beds are well irrigated through the drip line will help to establish a healthy root system. Growing Degree Days (GDDs) are important after dormancy (see Dr. Barclay Polings post). However, GDDs also play a role during the initial development of the root system and crowns before your plants go into dormancy. Dr. Jeremy Pattison (Driscolls’, CA, former NC State University) did research on GDD improvement in fall over three consecutive years in North Carolina growing regions (Coastal Plains, Piedmont, Sandhills) to improve fruiting capacity and he found that he could as much a 14% of fruiting capacity, compared to non-covered controls. Row covers (Figure 1) can be used to increase plant growth in Fall and help to increase GDDs. Different varieties will respond differently to this treatment and there is only limited data and experience available. However, it is crucial to understand how to use row covers in Fall, so that mistakes can be avoided. Dr. Pattison’s results show that Fall applications before temperatures dropped below an average daily high of 64 °F can result in a 14% increase in yield compared to the uncovered treatments. His research showed that even late planting dates responded positively to early applications of row covers and resulted in an increase of yield. There is a very good chance that you will be able to increase your crop if you apply row covers in late October/early November. Please only apply row covers if temperatures drop below 64 °F. You should monitor temperatures under the row cover, using a handheld thermometer. You should maintain a temperature between 65-85 F under a row cover. Even less is known on the water management after a late planting. However, as I have mentioned before, it will be crucial to keep irrigate your plants in order to promote a good root system growth.